Babblings of a Mommy: Spreading Joah Love Along With A One Good Thread Giveaway!!--CLOSED. Spreading Joah Love Along With A One Good Thread Giveaway!!--CLOSED. Peeps, have you checked out One Good Thread yet? (Shame on you if you haven't!) 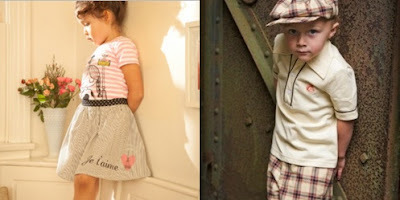 They have the cutest brands for your tiny tots like, Misha Lulu and one of my favorites, Knuckleheads. Along with generous sales like they're Bring On Summer Sale going on now until June 20th! Inspired by a child’s charm, One Good Thread Children’s Boutique is a pleasing ensemble of the most exclusive clothes for boys and girls. Every child should have at least one “special” outfit for each stage of their lives, and our store is sure to be that spot to find just the perfect one. If there was one brand from One Good Thread's inventory that truly stood out--it would have to be Joah L♥ve. Not only do we share a kinship for hearts, but they're clothing is literally to die for. (Talk 'bout some serious cuteness people.) This brand is a mix of euro-contemporary with a blend of buttery fabrics that is not only practical for parents but comfy for the kiddos. The kind folks over at One Good Thread were nice enough to send me the Joah L♥ve Ash Chloe Dress to try out and I gotta say that the first thing that stood out was how incredibly soft and rich the dress felt! It feels super luxurious for kids clothing and I was completely impressed with the texture and quality. The dress itself is 4 tiered grey tank dress with raspberry stripes from their spring 2011 collection. The dress is made out of a cotton/poly blend making it super comfortable even for my little munchkin to wear to the park. I just ♥love it♥ to pieces! 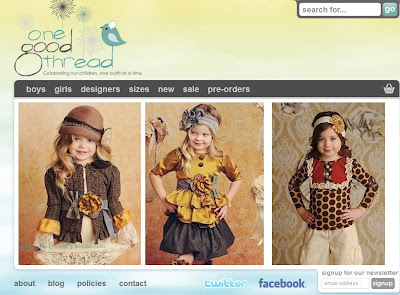 Ready to score yourself a sweet deal from One Good Thread? They're giving one lucky Babblings of a Mommy reader a $50 gift certificate--good for spring/summer inventory only! *Please remember to leave your email address on each comment. Winner will be notified via email. Check out One Good Thread's website and leave me a comment telling me what your favorite product/brand is! Follow me on Twitter and tweet this: "I hope to win the @Onegoodthread #Giveaway at www.babblingsofamommy.com @babblingofmommy"
Remember each one counts as a different entry so be sure to enter them separately. You may tweet once a day if you'd like, but be sure to leave comment on post about your re-tweets. I do check and verify entries. Giveaway ends June 30th . A winner will be selected by random.org and will be notified via email. *Product was provided for review purposes. See disclaimer/disclosure for more info. LOVE the Misha Lulu Mod Paris Dress! Loving the Right Bank Babies Navy & Gray Polo Jersey with the matching Right Bank Babies Squeaky Knee Jeans w/Knit Waistband! Wish they had as many boy clothes as girl clothes because their girl clothes are ADORABLE! i love the misha lulu botswana jumper dress! I am now Follow OGT on Twitter. I love Persnickety. All of it. But if she gets the Misha Lulu Fall line, I will be a very happy girl. I have already "liked" OGT on facebook (I think I was one of her first fans!) and I already get their newsletter - and anyone reading this comment should too - they have great deals! Thanks for the giveaway! Also now following your blog! Please enter me again! And I THINK I just added you to my Google Homepage (following your feed!) - as long as I did it right :) Thanks! Sorry for all the comments - I keep trying for more entries, and unfortunately I am trying things one step at a time :! Another entry for "Liking" Babblings on facebook! Yay! I followed OGT on Twitter. I like the Knuckleheads After A While Shirt . I liked One Good Thread on FB! I liked Babblings of a Mommy on FB! Love OGT ! If I have to pick a brand I like best I'd have to say Persnickety, but they are all adorable! I love just about everything on this site! I am already YOUR FB fan! My favorite designer is Meisha Lulu. Love the misha lulu botswana jumper dress! I love the livie + Luca peacock shoes! I follow OGT on twitter! I subscribed to your RSS. And I really do like your blog it is right up my alley and what I blog about! I also added your button to my blog and look forward to following you! I love the girls apparel by Persnickety. Signed up for the One Good Thread newsletter. I love the Persnickety Limited Edition Purple Rosebud Headband. CUTE! My favorite brand is Blu Pony Vintage -- very cute stuff! I like OGT on Facebook and told them you sent me! I love the Serendipity Euro Lightweight Organic Summer Dress! I "Like" OGT on Facebook. Love misha lulu - all of it! I really like the Botswana dress! LOVE thir site. persnickty is one of my fav designers/brands. signed up for their emails. I like them on fb and posted on their page. The Misha Lulu Hello Kitty Dresses are my favorite. I also love the Persnickety. My favorite is the Joah Love Indi Twill Cropped Hipster Pant! Like OGT on FB and commented (Nicole Hsu). Like you on FB and commented (Nicole Hsu). I like the boys knuckleheads rockabilly shirt. My favorite item is the Serendipity Euro Baby Girl Floral Romper. Following your blog on Facebook (Amy H). Following OGT on facebook (Amy H). I love the Deux Par Deux Bamboo Gingham Bubble Dress! One Good Thread's Newsletter subscriber! I like OGT on Facebook (Heather S.) and told them you sent me! I like Babblings on Facebook (Heather S.)! Feed subscriber via google reader!